Kurds Say They Have Retaken Strategic Mosul Dam From Militants : The Two-Way But the jihadist Islamic State said it still controls the dam, and that fighting is ongoing. If the Kurdish claim is confirmed, it would deal the militants their first major reversal since June. 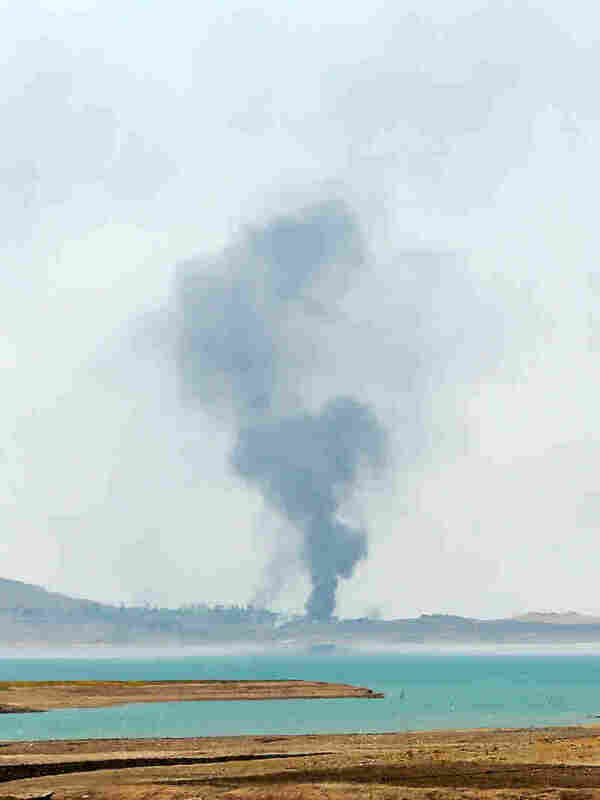 Smoke rises during airstrikes targeting Islamic State militants at the Mosul Dam outside Mosul, Iraq, on Monday. Kurdish forces say they have retaken the dam, but the militants insist they still have control. Kurdish forces say they have retaken a strategic Mosul dam from militants of the Islamic State, apparently dealing the Sunni jihadist group its first major reversal since its forces swept into Iraq in June. "The American Central Command says it continued airstrikes in Iraq against Islamist targets, and Kurdish peshmerga forces moved to retake the dam. Local peshmerga commanders say they gained control of the dam, but senior officials say some fighting is still going on, as well as efforts to neutralize booby traps left by the Islamist fighters calling themselves the Islamic State." But Peter told NPR's Morning Edition that the Islamic State, also known as ISIS, said on its Twitter account that it still controls the dam, and that its fighters haven't retreated. The group took the dam earlier this month. "The great fear, of course, is that a breach of the dam could send a wall of water down the Tigris, threatening Mosul and cities farther downstream," Peter told Morning Edition. The developments in Iraq came as President Obama, in a letter to Congress about the expanded airstrikes, said the failure of the dam "could threaten the lives of large numbers of civilians, endanger U.S. personnel and facilities, including the U.S. Embassy in Baghdad, and prevent the Iraqi government from providing critical services to the Iraqi populace." In London, Prime Minister David Cameron said limited action was needed in Iraq to prevent violence from returning to the U.K. But, he told the BBC: "We are not going to be putting boots on the ground." U.S. Central Command, in a statement, said U.S. forces continued to attack the militants near the dam Monday, "using a mix of fighter, bomber, and remotely piloted aircraft." "The strikes damaged or destroyed nine ISIL fighting positions; an ISIL checkpoint; six ISIL armed vehicles; an ISIL light armored vehicle; an ISIL vehicle-mounted anti-aircraft artillery gun, and an IED emplacement belt," the statement said. "All aircraft exited the strike areas safely." ISIL refers to the Islamic State for Iraq and the Levant, another name for the Islamic State. The statement added that since Aug. 8, Central Command has carried out 68 airstrikes in Iraq, including 35 near the Mosul Dam. Pope Francis says the world must unite to stop the "unjust aggression" in Iraq where Sunni militants have targeted the country's minorities. You can read more about his comments here. During a White House press conference, President Obama praised the efforts of the Kurdish and Iraqi forces he said took the lead on the ground in retaking the dam and pushing Islamic State forces back from Irbil. He also encouraged the newly selected Iraqi prime minister, Haider al-Abadi, to continue efforts to form a new, broad-based government, saying that it should help unite the nation against Islamic State militants — and that politicians shouldn't see U.S. airstrikes as a sign that they can afford to return to past infighting. "They've got to get this done, because the wolf's at the door," Obama said, "and in order for them to be credible with the Iraqi people, they're going to have to put behind [them] some old practices." The president said that he had no estimate for how long it would take to contain the Islamic State, but that he expects regional partners and Sunni tribes to ante up once a stronger Iraqi government is in place. Regardless, he said he expects Iraqis to continue taking the lead against the Islamic State. "I have been firm from the start that we are not reintroducing thousands of U.S. troops back on the ground to engage in combat," Obama said. "We are not the Iraqi military — we are not even the Iraqi air force." Obama also said that the United States is building a coalition — which currently includes the United Kingdom, Canada, Italy, France and Australia — to provide humanitarian aid to those displaced by the militants in northern Iraq, including the Yazidi community.